There is a video that has gone viral on Facebook of a dog wearing a spider costume. 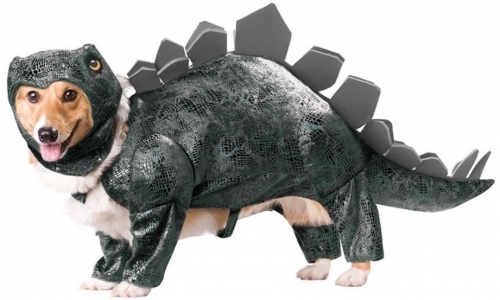 It got me thinking that maybe I should buy Milo his first Halloween costume this year. 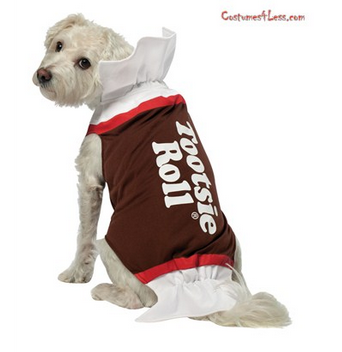 When I started looking at the options of Halloween costumes for dogs, it really is hard to choose. There are so many adorable costume options. 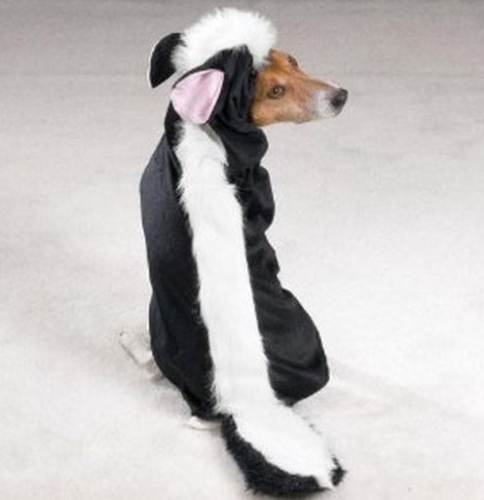 Of course, you need to know what your dog will tolerate with wearing clothes. 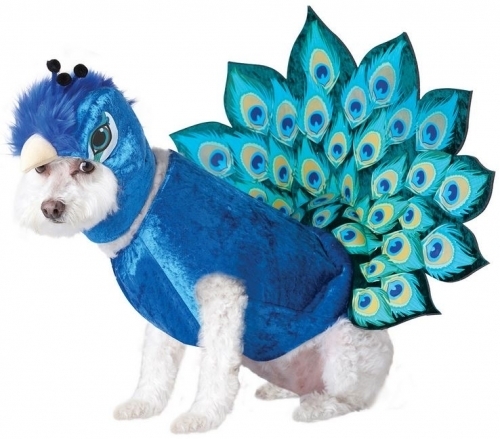 Some of these costumes are pretty elaborate and involve clothing on the dog’s head and feet. After seeing how Milo walked in boots last winter, I don’t think costumes with feet would work for him. 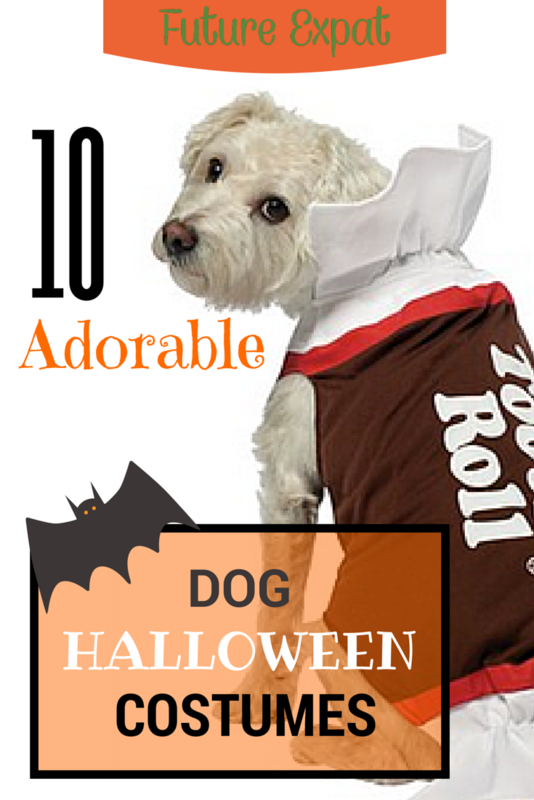 If are looking for a Halloween costume for your dog, all of these will be a big hit at a party and help you collect lots of candy while you are out trick or treating. 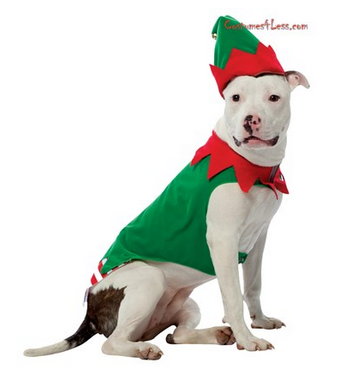 Elf costume…perfect for Halloween and Christmas! 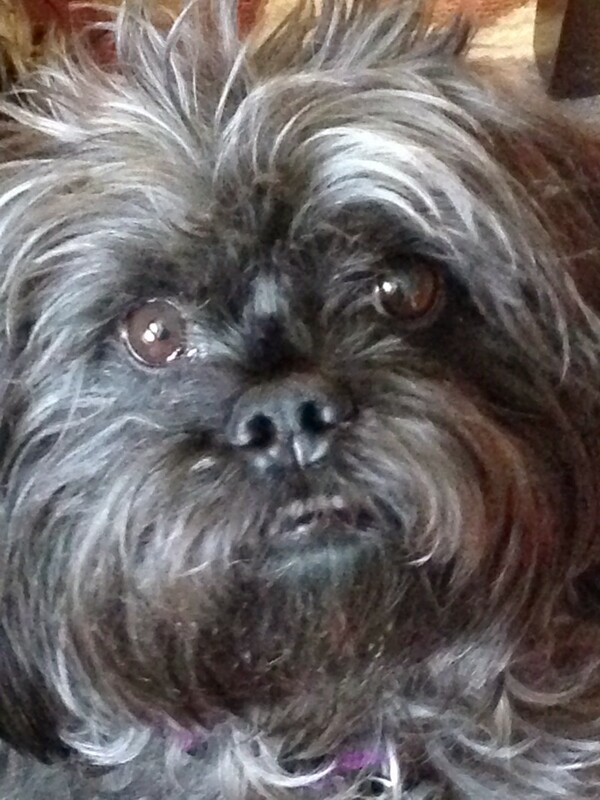 This last one I had to include because I hear over and over that people think Milo looks like an ewok. I’ve never really been a Star Wars fan, but I’m tempted to buy it anyway. 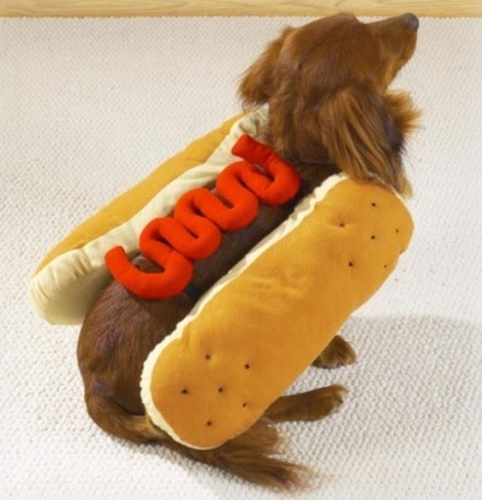 What about you…do you dress up your dog for Halloween? If you do, I’d love to hear about your favorite costume and how your dog does with things like hats and clothing on his feet. DISCLOSURE: Some of the links in this post are affiliate ads. If you click the links to these products and purchase something (anything) from the online store, I will be paid a small commission. I do not advertise products simply for the commission. If there is an affiliate link in an article, I think it is something that might benefit my readers. These are so adorable! I really wish my cats would wear costumes! 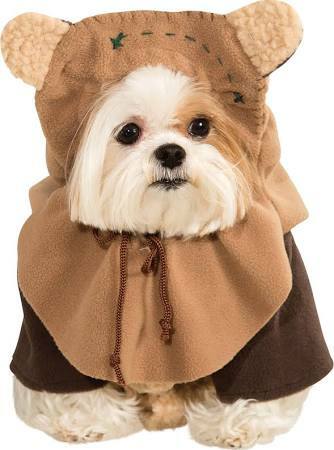 The Ewok costume is absolutely adorable! And the hot dog one is too much pardon-the-pun like. I’d vote for Ewok one! all 10 of these costumes are adorable 🙂 I think my Macy would have to be the skunk, she is so spoiled she stinks!! 🙂 Thanks for sharing at our Retro Re-Pin party! I love the first two costumes! It’s so hard to find costumes that fit German shepherds. I really want a shark or a Batman costume for Leo. Someone suggested I get a child’s costume and modify it. Mia is less tolerant of costumes, but I really wanted to try this 3X-large Chewbacca hoodie from Petco. However, the reviews made me think it probably wouldn’t be big enough. I imagine it is hard finding costumes for big dogs. I saw a few cape type of costumes online. One was Zorro and quite cute. That might work for you. If you click through to the links, you’ll see some other costume options. I pulled them from 3 different sites to get some variety. You are so right! Big dogs are discriminated against at Halloween. Even costumes that say XXL won’t fit around Jedi’s chest and/or aren’t long enough for his body. I’ve seen several craftier-than-me owners alter child costumes. I loved the video. 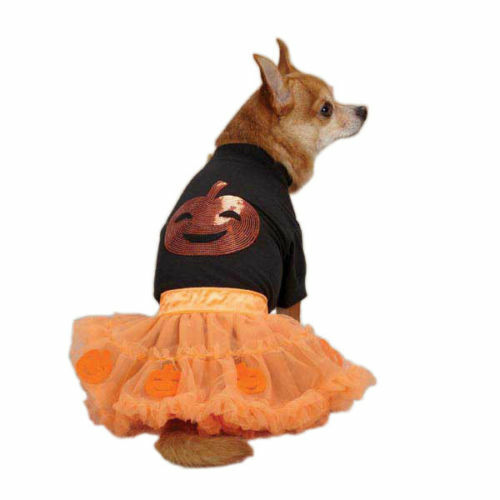 Looks like Milo just couldn’t get that left hind leg to act right – BOL.All the costumes are adorable too! I eventually gave up using the booties because he would end up walking them off a couple of times during each walk. The front legs stayed on well…maybe this year I’ll just use front booties and at least 2 of his feet will be warm. That video made my day! So funny:) Thanks for sharing with us at the Teach Me Tuesday Linky Party! Love this post! Well, errrr, I’m very well known to LOVE to dress up! They have Halloween costumes too. Hee Hee! Hi – nice to meet you. We just hopped over here from Pepi’s blog hop. 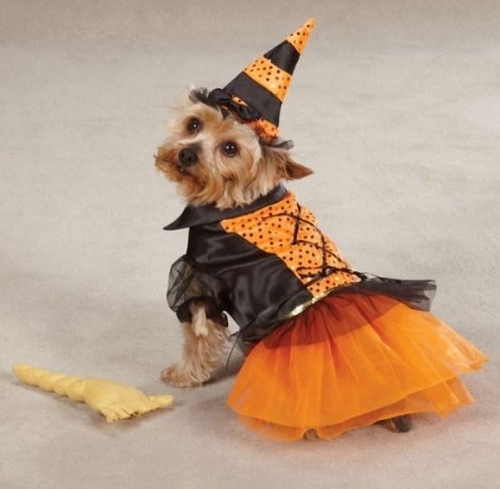 Now me – I don’t like to dress up for Halloween, but you doggies sure do look cute in them. Very nice collection, thanks for sharing with Hearth and Soul blog hop. pinning. So cute! Olive is going to be Yoda this year. She actually seems to like wearing the costume: http://instagram.com/p/tgcvAjIHJO/?modal=true. 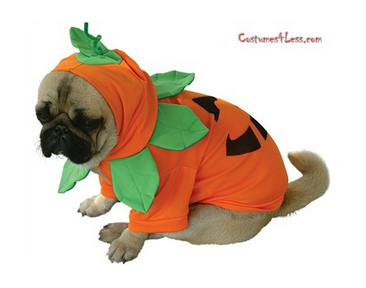 Pug has a pumpkin and hot dog costume. But we need the Ewok!